Using a Content Management System (CMS) enables you and other website administrators to easily manage your websites content, files and other media all in one place - without needing to learn any programming languages. Using a CMS can be empowering, reduce costs, reduce development time and increase productivity. 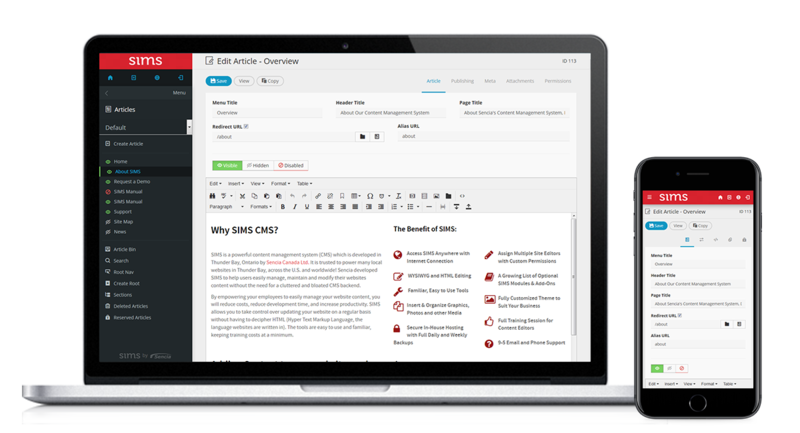 SIMS is a robust CMS that lets you take full control of your website - content can easily be added, edited and removed on any device. The tools are easy to use, familiar and built for accessibility, keeping training costs at a minimum. Update your website in any web browser on any device, programming skills not required. SIMS allows you to take full control of adding, editing and removing website content and files. Instantly access your website whenever and wherever you are without needing to understand programming or design skills. Editing and authoring content is template based and enabled through a browser - meaning you won't need to install, update and maintain any specialized software. Updates to SIMS Content Management System are completely automated, so you'll always have the latest version of SIMS. Templates and programming are kept separate from your content, which is stored independently in a database. All you need is an internet connection and a web browser. Updating your website is easy! SIMS Editor makes use of an advanced WYSIWYG (what you see is what you get) Editor, an advanced file uploader and a media library. Together, these tools allow you to easily update your website's content. The WYSIWYG Editor displays a selection of common and advanced content editing tools in an easy to use interface similar to many popular document editing software. The Editor is designed to offer everything required to easily edit content while maintaining style consistency. SIMS File Uploader allows you to upload images, videos, audio and HTML files. Uploaded files can be inserted directly into your website without the use of FTP (file transfer protocol) software. SIMS Media Library allows you to easily upload, edit and delete files directly from your Administration Panel. The Media Library stores; Images, Audio, Video, Documents, Flash, Images and Templates which are organized by file-type and placed, as desired, into customly named folders. SIMS eliminates need to pay high development costs by outsourcing or hiring staff in-house to create and update your website. Along with the ease of content management, you are also able to request customized forms for visitors to complete, which can be a valuable source of data from your audience. All from the comfort of a web browser!